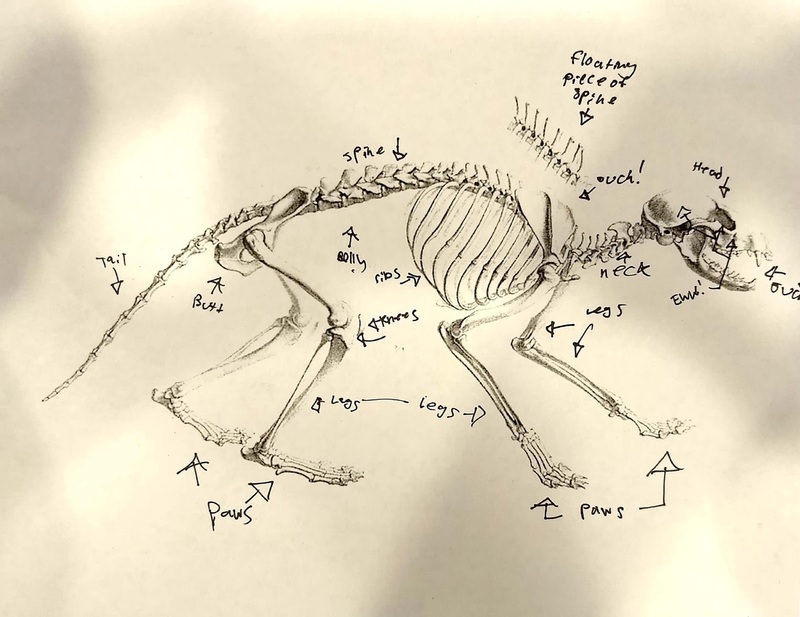 I was out of town giving a public talk last week when I got this picture along with a text from my husband: "Zooarch consult plz." 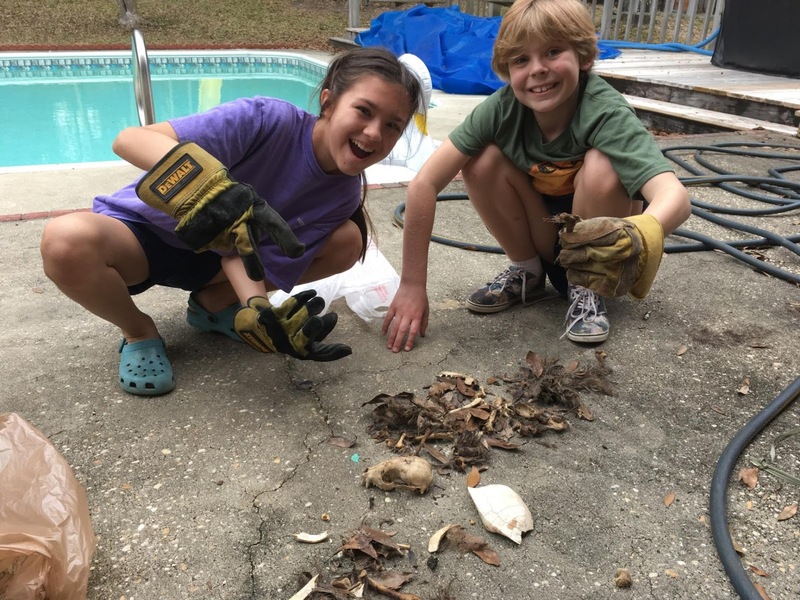 That's my 8-year-old, Cecilia, on the right along with her BFF. 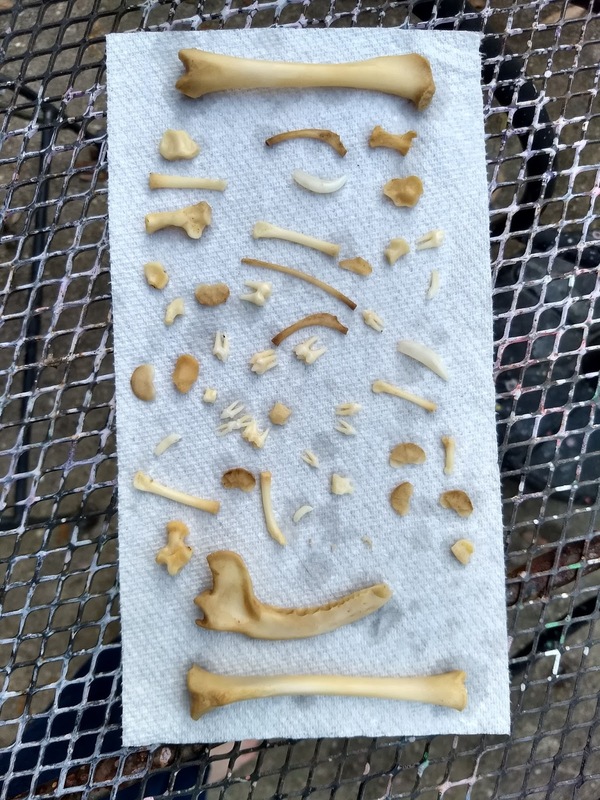 They were traipsing through the small patch of woods behind our house and found some... dead stuff. Squinting at my phone, I typed back that there was a turtle and maybe a small dog or something, but that I'd check it out when I got home. And to wash their hands well. The girls gathered the bones-and-fur mess and tied it off in a plastic bag. 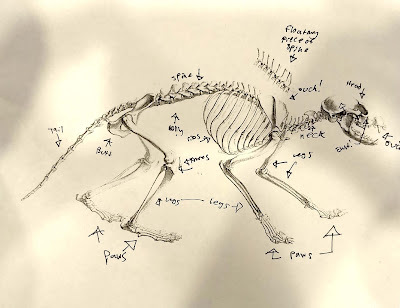 Once I got a look at it, and posted to Facebook for a consult, I realized it wasn't a dog but rather a raccoon. 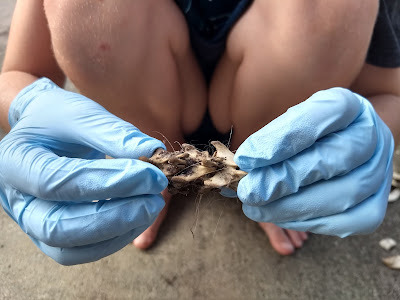 The next step was to separate the raccoon from the turtle shell and pick off the gross decaying fur. So I brought home some nitrile gloves from my lab. 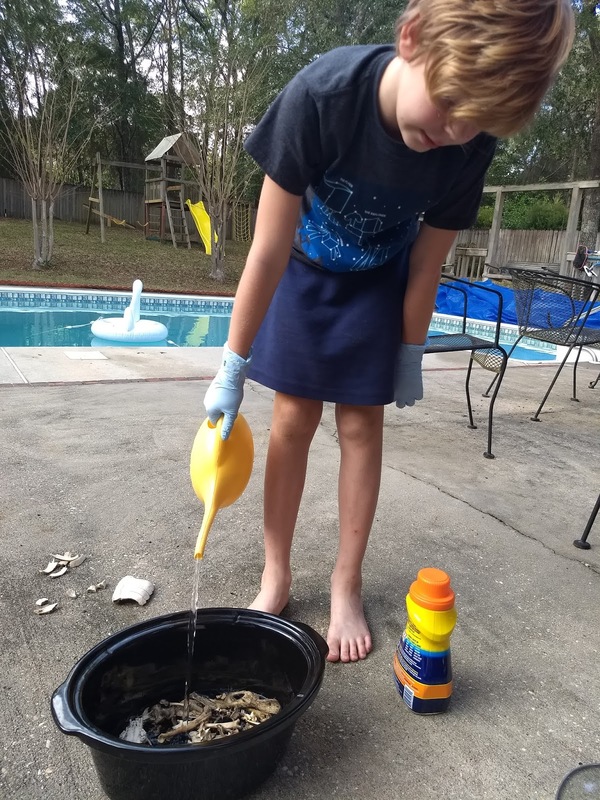 She filled it about 2/3rds of the way up with water from the garden hose (which she wanted to put in the watering can for some reason). 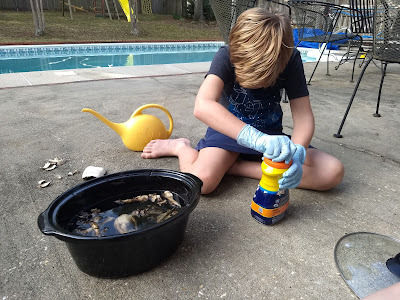 Then, we had to add detergent. Biz was recommended to me by our resident faunal expert in the department, so I bought a small amount of it at Publix. We put the lid on, turned the crockpot on to the low/4-hour setting, and left it alone. 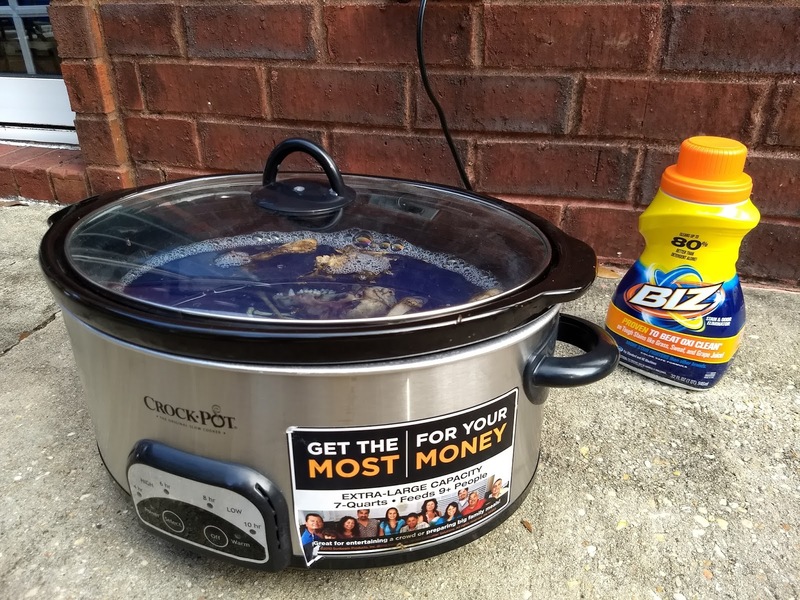 Since we didn't start this quite early enough in the day, by the time we turned the crockpot off, it was getting dark. 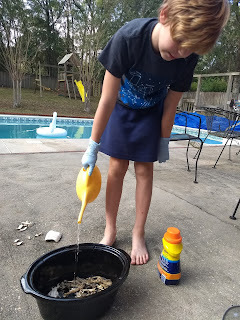 I decanted the sudsy water off carefully, and then dumped the rest of the water-and-bones out onto the cement patio. 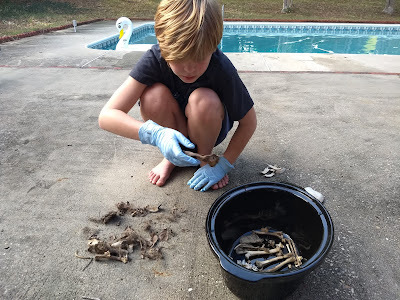 We collected the bones and set them on the metal table outside, and I let Cecilia and her friend scrub the bones with old toothbrushes to get the remaining fur off. Once the bones were cleaned, I tossed them into a disposable tupperware bowl, dumped in all the hydrogen peroxide I had (maybe 1.5 cups), and topped the bowl off with water and capped it. I didn't take any pictures of this, but we left it on the kitchen counter for like 3 days, swirling it occasionally. 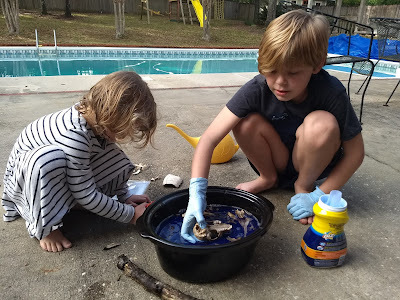 When we were happy with the color, we dumped the bones out of the hydrogen peroxide solution and let them dry on the table outside. 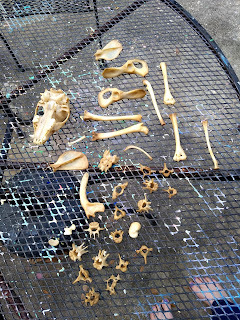 After the bones were dry, I printed out two diagrams of raccoon skeletons. 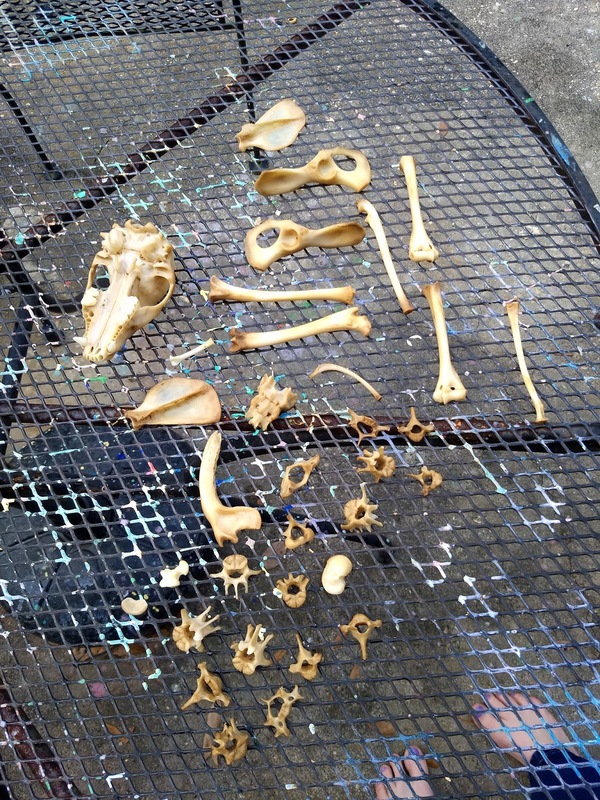 I gave those to Cecilia along with the clean, dry bones, and let her puzzle out where they all went. 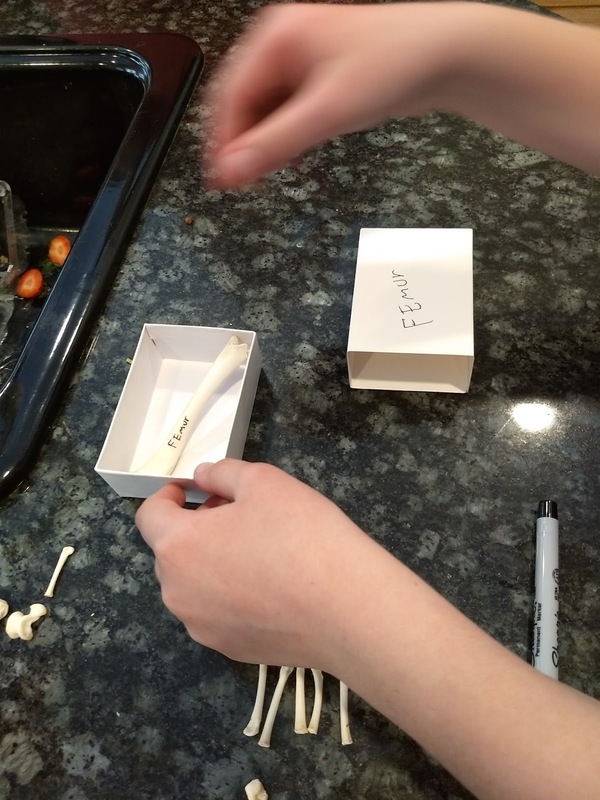 Cecilia wanted to label the bones and put them in labeled boxes or bags, so I helped her by telling her the correct plurals where relevant. And that's it! 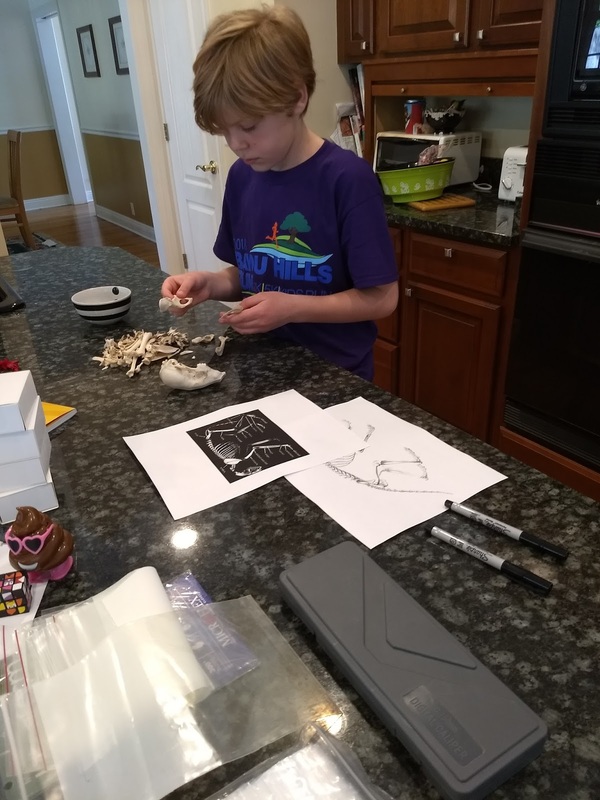 We finished labeling the bones this afternoon, and now they're in little bags and boxes, waiting for... well, who knows. I'm interested to find out what Cecilia wants to do with her raccoon! So, if your kid brings home a random dead thing, all you need are a crockpot, some detergent, and hydrogen peroxide, and... voilà! A STEM-worthy project. I LOVE the little drawings on the labelled boxes! That should be a requirement for museum collections, too! This is fantastic. 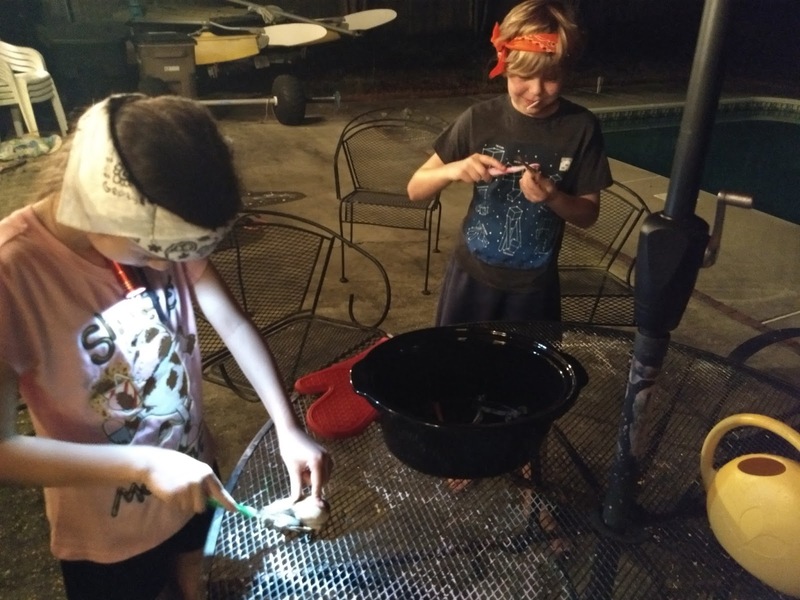 What a great way for your kids to learn. My two sons (similar ages to your daughters) would LOVE this. Cool project :) I have three sisters, and when we were younger we were always interested in things like this. It isn't everyday you get to learn about things like this; the usual responses from adults are, don't touch that! You'll get a disease or rabies! But it's really nice of you to have cultivated their interests and curiosities. 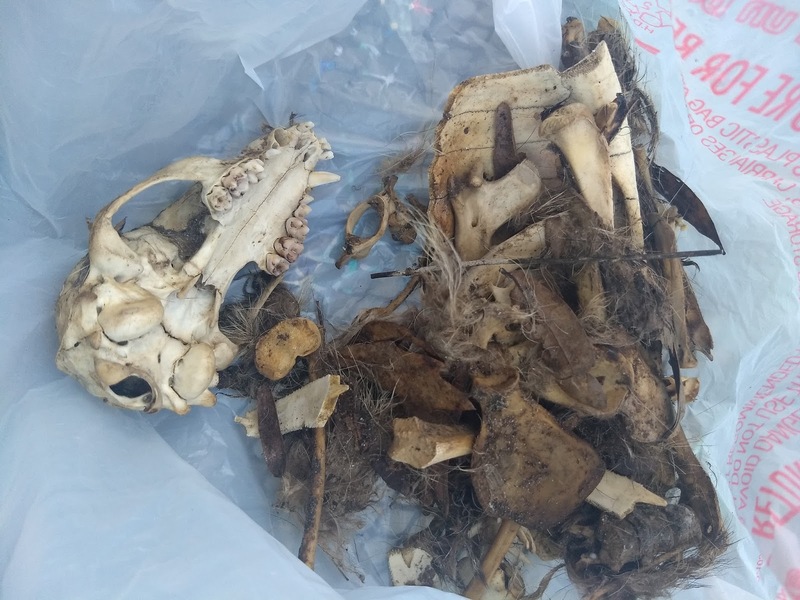 During my first training excavation in college I found a recently-dead raccoon and, over the course of three months, recorded its decomposition. Sadly, we didn't have the equipment to macerate the skeleton as well! With yours and Patrick's careful parenting your daughters will grow to have well-nurtured senses of inquisitiveness, as well as the skills to act. They're very lucky. Hey, is that a Hobie in the background?